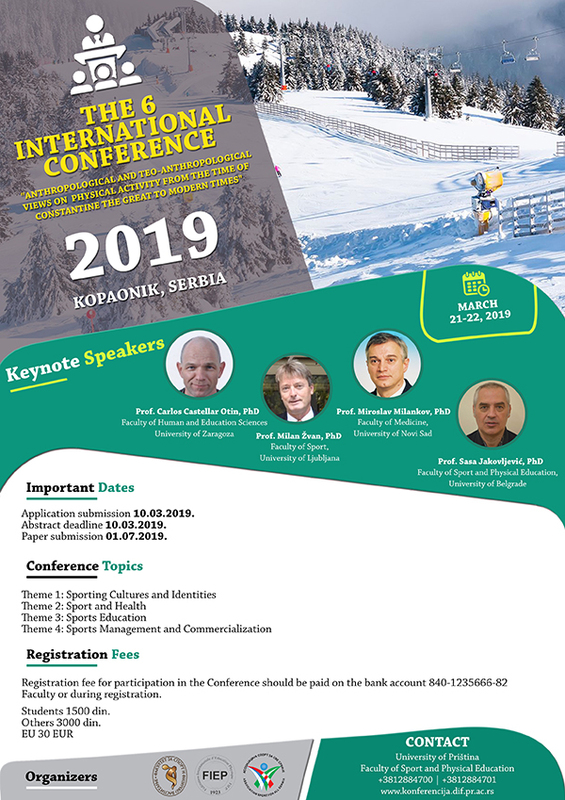 Deadlines for registration and submission of papers – INTERNATIONAL CONFERENCE "ANTHROPOLOGICAL AND TEO-ANTHROPOLOGICAL VIEWS ON PHYSICAL ACTIVITY FROM THE TIME OF CONSTANTINE THE GREAT TO MODERN TIMES"
"ANTHROPOLOGICAL AND TEO-ANTHROPOLOGICAL VIEWS ON PHYSICAL ACTIVITY FROM THE TIME OF CONSTANTINE THE GREAT TO MODERN TIMES"
Registration of participants until 10.03.2019. Report an abstract in English 10.03.2019. Delivery of the complete papers, as of 01.07.2019. One participant may appear in the role of author or co-author, the most in two papers. Works with a summary in English a published in the Proceedings of the international editorial board and distribution.